Marty Baron spoke to the public today at 7:30 in the Schoonover Center at Ohio University. 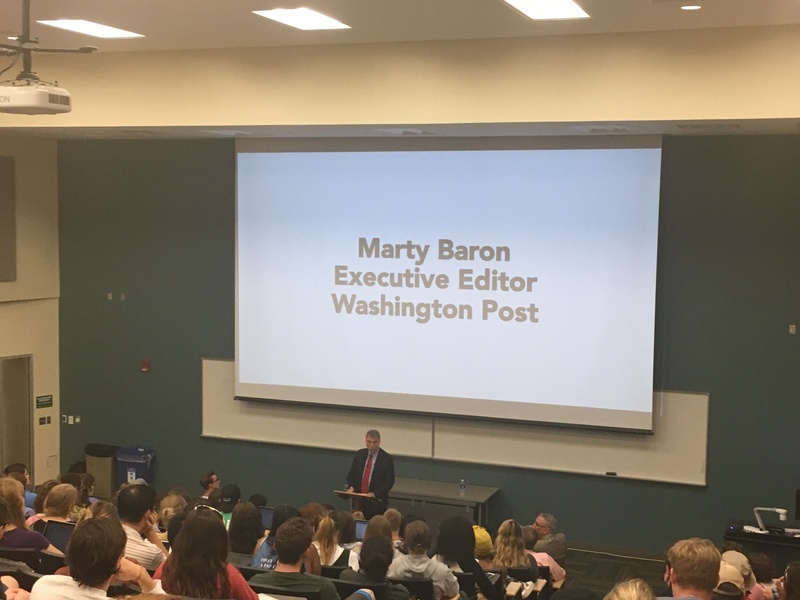 Marty Baron, the executive editor of the Washington Post, paid a special visit to my freshman Journalism 1010 class today. Despite his impressive resume of the Miami Herald, Los Angeles Times, the New York Times, the public knows him best as the former editor of the Boston Globe during the 2002 Spotlight investigation of sexual abuse in the Catholic Church. The Pulitzer-prize winning story was so high-profile and important, it inspired an Academy-award winning movie “Spotlight”, starring celebrities such as Mark Ruffalo, Rachel McAdams, and Michael Keaton. Baron was played by Liev Schreiber. Baron speaking to my freshman class was a huge deal (and that would be an understatement). The executive editor of a major newspaper took time out of his schedule to speak to a classroom of potential journalists, which shows how important the future of media is to him. Following his speech, I shook his hand and thanked him for coming. He was extremely welcoming and kind. 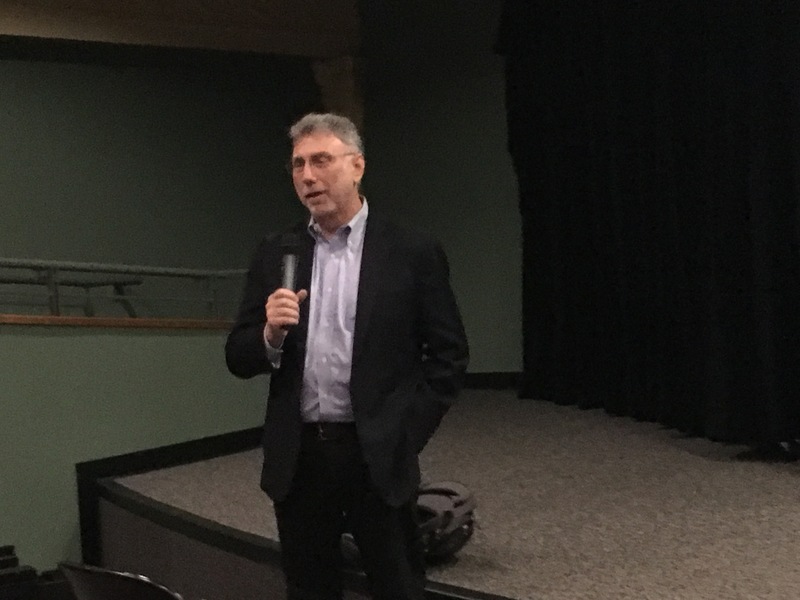 Marty Baron gave an introduction to a free screening of “Spotlight” at the Athena Cinema. Later that night, the Athena Cinema in Uptown Athens screened “Spotlight” for free, where Marty Baron again made a guest appearance to introduce the movie. Surprisingly, the theater wasn’t very full so he spent a few minutes chatting with two of my friends and me (I was pretty starstruck by such a big journalism superpower, but I think I held it together pretty well). Baron then spoke about the production of the movie. His colleagues, as well as himself, had little faith in the project initially. The movie took years to script, with thorough fact-checking and research, and quite a bit of time for a studio to pick it up. Actor Mark Ruffalo invested heavily in the movie, setting aside all other higher-paying gigs because he believed in the project. Still, expectations for actually getting the movie made were low among journalists, especially once Pope Francis–a pretty popular Pope at that–was appointed. Yet, against all odds, a journalistic-driven movie that had no gushy love story, no flashy graphics, and no fast-paced action scenes not only entered theaters, but won the Academy Award for Best Picture in 2016. After an emotional viewing of “Spotlight” for a second time, I headed back to Schoonover to listen to Baron speak again, this time to the public. After his speech, the director of the E.W. Scripps School of Journalism Robert Stewart presented him with the Carr Van Anda Award. Baron is the 75th recipient of this award. 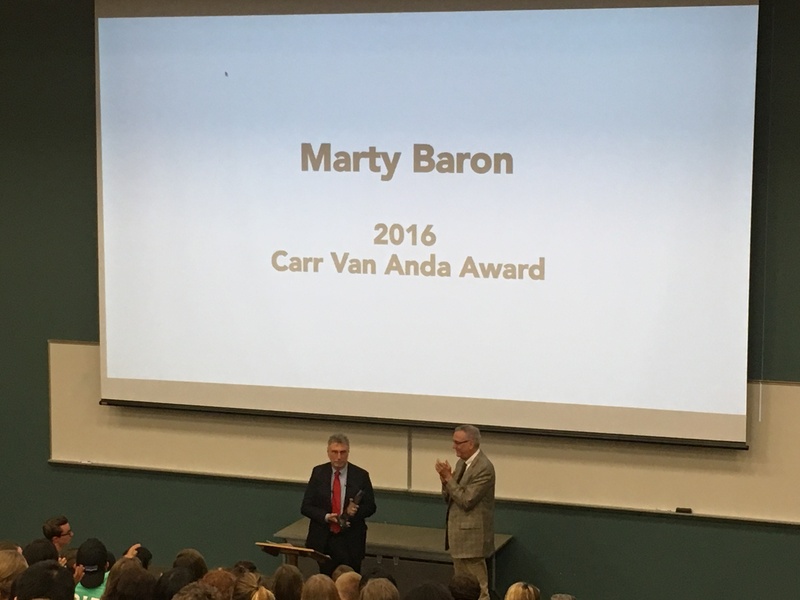 Robert Stewart presented Marty Baron with the Carr Van Anda Award. Baron talked about the 2002 Spotlight case, but also focused a lot on media in the current era moving forward. The Washington Post has dealt with some pretty heavy issues this election season. Republican nominee Donald Trump revoked The Washington Post’s press credentials for months, which have recently been reinstated. Trump has called journalists “disgusting”, “scum”, “low-life”, “the lowest form of humanity”, then even “the lowest form of life”. Baron joked that he couldn’t really call us anything worse at this point. This is a very difficult time for journalists. On one hand, Baron said, we have a Democratic candidate who has dodged hard-hitting questions for quite some time, then on the other, we have a Republican candidate who openly despises media. I am only a first-year journalism major. Whoever is elected will be in charge for the duration of my academic career and potentially for the first few years of my professional career. It is terrifying to me that there could be a president who blatantly discredits my profession. “The first amendment is at the very heart of what makes this country great,” Marty Baron said tonight. Truth, above all, is what is important to good journalism. I am entering this field because of my passion for the work. There are important issues to uncover and expose in this world. “Spotlight” is just one example of the hard-hitting journalism that is vital to society. Thanks to Marty Baron for visiting Ohio University and sharing his wisdom with us.